Why should you choose a pediatric dentist for your child? Choosing your child’s first dentist is an important decision. Not only will this person care for your child’s oral health, but they will shape your child’s ideas and feelings about dental care and dental visits as well. Though you, understandably, may want to take your child to your family dentist, a pediatric dentist may be a better option. Consider the below reasons why you should choose a pediatric dentist. 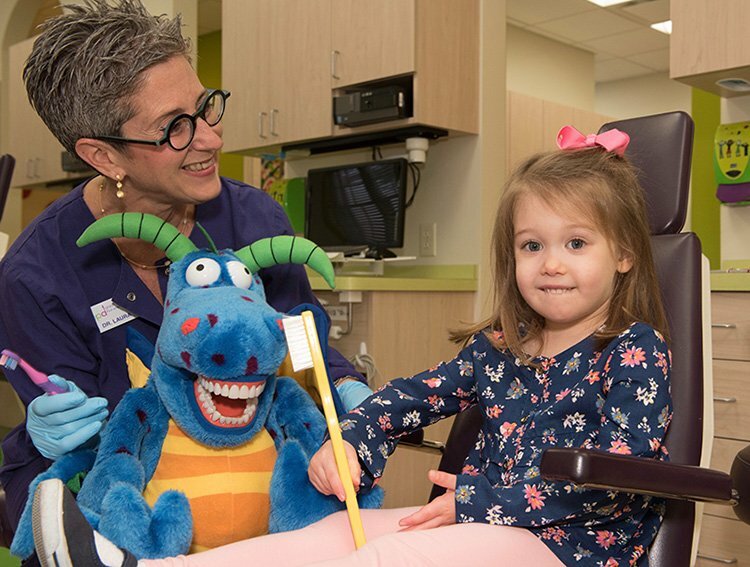 Pediatric dentists are uniquely poised to address a child’s full range of needs during dental visits. Unlike general or family dentists, pediatric dentists have at least two additional years of school after completing their DDS or DMD. During these extra years, they focus on understanding the different physical and emotional stages of development your child will experience. This enables them to address your child’s oral health care needs while supporting them emotionally during trips to the dentist. Baby teeth are not just small adult teeth. Baby teeth differ in important ways from permanent teeth. They are not just smaller in size. For starters, they eventually fall out! The two types of teeth have other structural differences which impact treatment practices and options, too. For instance, baby teeth have softer, thinner enamel than permanent teeth. They also have larger nerves and nerve chambers relative to tooth size than permanent teeth have. As a result, a small cavity in a baby tooth can spread more quickly to neighboring teeth. Also, even small cavities can impact the nerves. Pediatric dentists work with these realities on a daily basis, so they better understand how to diagnose and treat presenting problems. Children are not just small adults. Let’s face it. Sometimes a trip to the dentist is a little stressful or scary, even for adults. Children and adults need different emotional supports to help conquer their dental fears. Moreover, what strategies work for a 2-year-old are unlikely to work for a 10-year-old, and vice versa. A pediatric dental practice excels at meeting children where they are. They adjust their strategies and treatment options to treat the whole child while in their care. Different dental treatment options make sense at different stages of life. Because they are dealing with a mixture of permanent and baby teeth, pediatric dentists typically offer a wider range of treatment options than general dentist practices. For instance, more and more pediatric dental practices offer silver diamine fluoride (SDF) treatments for children. Because this treatment leaves some dark staining behind, many general dentists shy away from its use. In a baby tooth that will eventually fall out anyway, however, this treatment makes more sense. Pediatric dentists focus more time on education and cavity prevention. At the heart of the best pediatric dentists lives the desire to educate kids and families about oral health. They view themselves as teachers as much as dentists! Much of your child’s time with a pediatric dentist will focus on brushing and flossing techniques. Likewise, they will dedicate time to discussing the role nutrition plays with cavity prevention and overall oral health. To help your efforts along the way, they will provide sealants and fluoride treatments to prevent cavities as well. Your child will love visiting the dentist! All of these reasons add up to your child loving the dentist. A children’s dentist knows that learning must be fun, so they design the entire office and experience with that goal in mind. Dr. Laura Adelman, DMD, and Dr. Rachel Rosen, DDS, are experienced pediatric dentists on the borders of Solon and Twinsburg, Ohio. With over 25 years of combined dental experience, Dr. Laura and Dr. Rachel know how to make dental visits fun for kids while re-assuring parents along the way. If you’re looking for a children’s dentist near Solon, our dental office is only a little over 1 mile from its border off of Route 91 South. Our dental office is also only a little over 5 miles from Aurora and 7 miles from Hudson. Great Beginnings Pediatric Dentistry welcomes all children, regardless of abilities. Dr. Laura and Dr. Rachel believe all children deserve fun, compassionate dental care. No matter your child’s emotional or mental abilities, they are welcome here. We are accepting new patients under the age of twelve years. Call our Twinsburg children’s dental office today at (330) 425-1885 to schedule an appointment. Give your child all the benefits of visiting a pediatric dentist has to offer. Copyright (c)2017 Great Beginnings - No duplication without written consent.